French Revolution While the educated delegates of the 3rd Estate pressed for symbolic equality with the nobility and the clergy in a single legislative body at Versailles, economic problems tightly gripped the throats of the common people of France. Grain was the basis of what the ordinary people ate, but the price of bread was high and it kept rising. Harvest failure and high bread prices unleashed an economic depression on the people, who were on the verge of revolting. Then stories about nobles insulting the poor and rumors that the king's troops would sack the city began to fly. Angry mobs formed and took action. 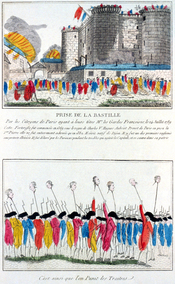 The people gathered arms and on July 14, 1789 they marched to Bastille to search for gunpowder, but the governer of the medieval fortress-prison refused to hand over the powder. He panicked and ordered his men to fire, killing ninety-eight people. People brought cannons to batter the main gate, and the fighting continued until the prison surrendered. 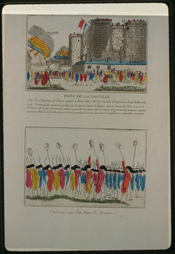 The Bastille of Paris before the Revolution. The Early Hours of Bastille Day. WriteWork contributors. "French Revolution" WriteWork.com. WriteWork.com, 01 February, 2008. Web. 20 Apr. 2019.